Hello there, it’s feline editor Clyde here with another Black Cats Tell All Monday. This week I tell all about Pillow Foot. No, it’s not the name of a cat but our adorable adoptable featured cat Treasure has it. Plus I’m sharing some love for Pet Animal Welfare Society or PAWS, a shelter in Norwalk, Conn. It’s where I was adopted as a kitten and surrendered back there at age 16. Luckily I was only there for a few months and landed a new life here with my new cat parents Layla and Joe. Any cat or dog who winds up at PAWS has a better than average chance of being adopted thanks to their exemplary programs and staff. You never know who you might meet there. 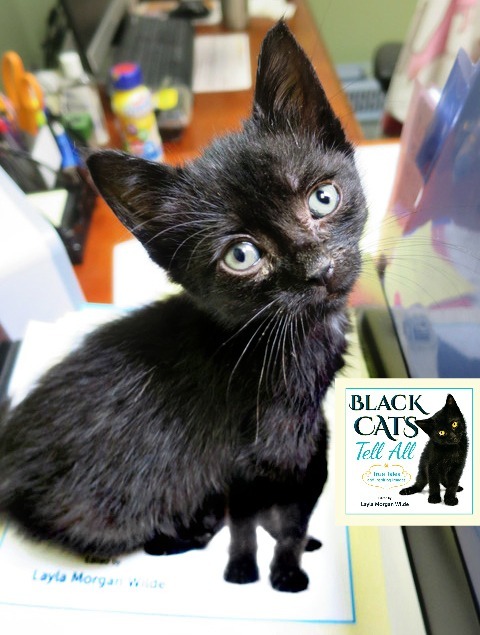 Look at this charcoal nugget sitting on my book in the PAWS office Ellen, the adoption coordinator. Thank you to Maggie for sending us the creative pic. 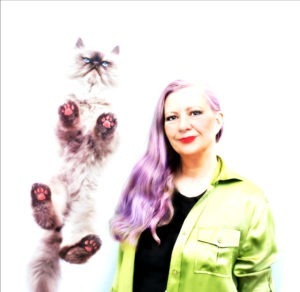 She is a volunteer and meowvelous illustrator who blogs about the shelter. 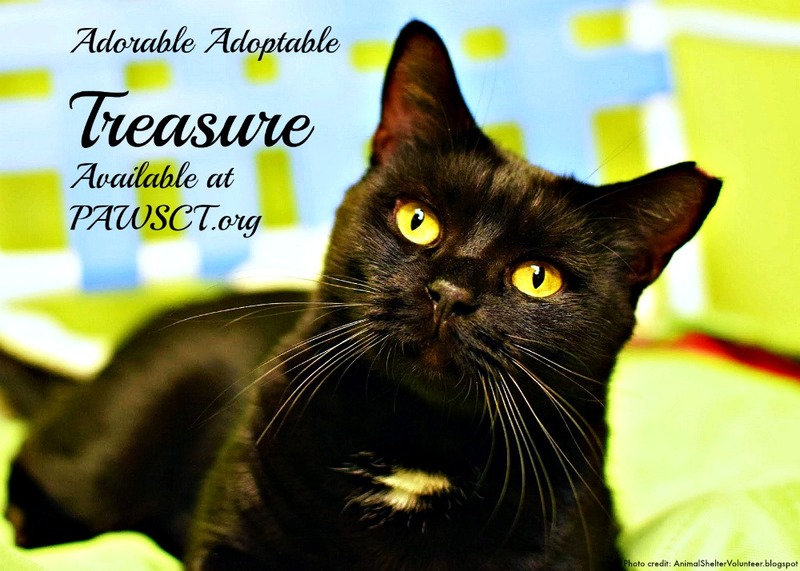 My fellow black cats and tuxie cats need all the help we can get which is why we’re featuring adorable adoptable, Treasure. I’ve been doing good all things considered besides a recent marathon howl session of 45 minutes in the car. Yes, for a dignified old gentleman of 18, I howl like a banshee nonstop to the vet. I’m perfectly fine once I get there and appreciate of the loving care from PAWS. When you get old, anything can shift quickly which is why it’s important to have regular check-ups with diagnostic tests. I’ve been drooling more than usual so it was no surprise to learn I need extensive dental. My test results arrived last week and again nothing shocking. Things could be a lot worse with diabetes and CKD at my age. It looks like I might have pancreatitis again and my phosphorous values are up. More than ever, my mom is evaluating the importance of a good diet for prevention or management of many feline diseases and conditions. You are what you eat, right? We highly recommend finding cat food with low phosphorous even if you’re healthy. It’s never too late to find out what’s really in your cat food. Have you ever heard of Pillow Foot? Neither had I but Layla who has an auto-immune disorder understands the delicate and sometimes difficult balancing act. Pillow Foot or Pillow Paw is Feline Plasma Cell Pododermatitis, an auto-immune condition our featured adoptable Treasure has but does not make her any less adoptable. It’s being controlled with meds and diet. It’s a condition that can be easily overlooked and begins with a swollen paw pad. Gradually the swelling grows more tender and may appear bruised. It may affect one paw pad or more. With Pillow Foot, the pads are infiltrated by plasma cells, a type of white blood cell or immune system cell that secretes antibodies in response to an infection. In effect it causes the body to attack itself. While Pillow Foot is rare, it’s always wise to check your cat’s paws for signs of swelling, cracks or bruising from other causes. This photo of Odin who has the healthy paws of an active indoor/outdoor cat. Note: It’s easier to spot discoloration, abrasions or cracks on pink paw pads than dark gray or black ones. 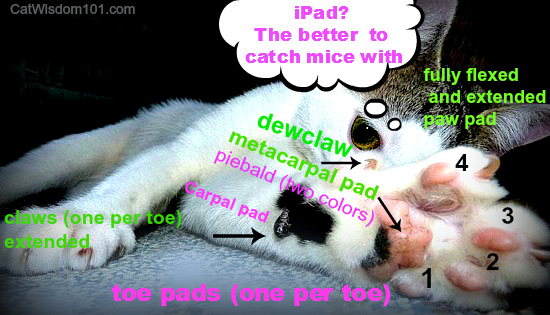 With Pillow Foot the cats’ paw pads become increasingly puffy and tender. If not treated, they can crack resulting in secondary infections and lameness. Cats are notorious for hiding symptoms and may try to hide their pain despite the pain of walking. Don’t wait until a cat is noticeably limping, please see a vet for an accurate diagnosis. Once diagnosed, treatment may begin antibiotics and or steroids. Another reason it’s easy to miss symptoms of Pillow Foot is it tends to be cyclical like all auto-immune disorder which ebbs and flows with flare-ups. 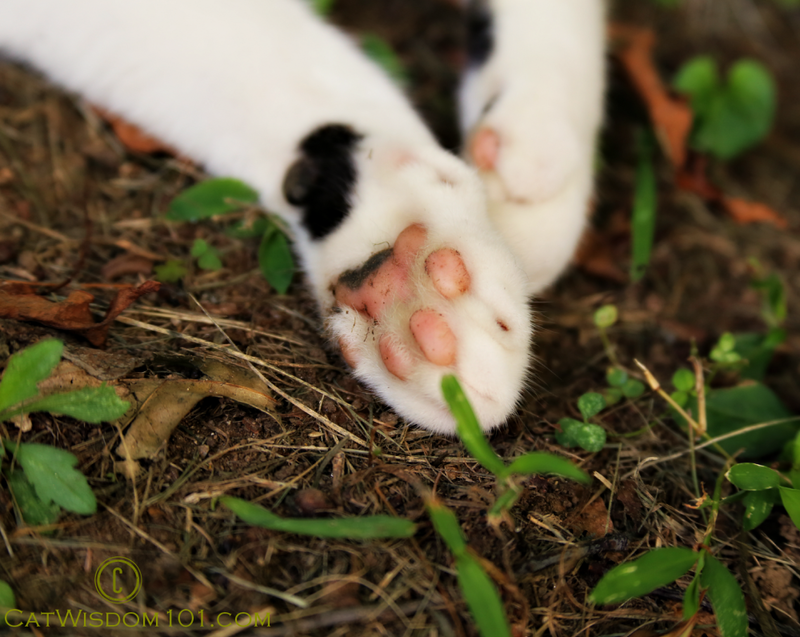 The spongy paw pads may cause limping in some cats but not others. Notice if your cat is licking their paws more frequently or favoring one foot over another. As cats age, they often groom themselves less often. I’m an excellent example of sloppy grooming. I can’t do the acrobatics of my youth but thank the cat gods, my mom, grooms me daily. She brushes and wipes, pokes in my ears and *blushes* looks under my tail. I’m known to get cat litter stuck between my toes so every day I get a paw check. Layla calls it checking my “jelly beans”. For cats that don’t like having their paws examined, only do a few at a time and a treat reward will help. As a cat gets more comfortable being handled, the easier it is to handle trimming nails. Try to do a thorough paw check at least once a month to nip any “bean” problems at bay. 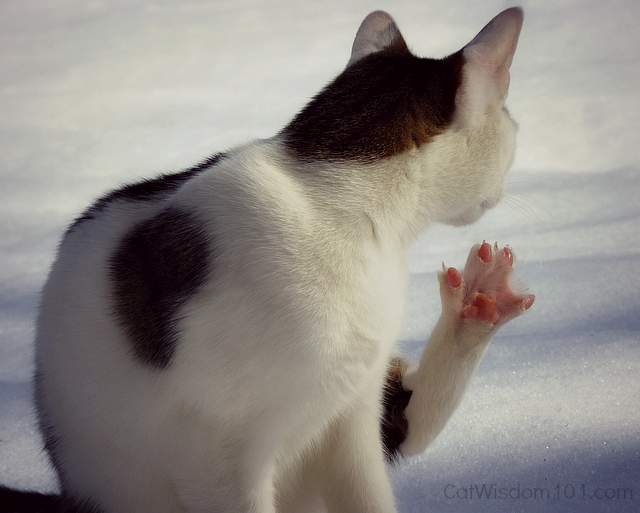 My younger and more limber fursib Odin demonstrates paw grooming in the snow. We take extra care checking him after his daily walks. Like all auto-immune conditions Pillow Foot has no definitive cause and can be frustrating to treat, but all are inflammatory in nature. Any disease that ends in “itis” like arthritis, dermatitis, pancreatitis, conjunctivitis all cause swelling or inflammation. For instance, in examining my blood work, elevated lymphocytes are a tip off that the body is fighting something immune-related. i.e. My lymphocytes are elevated because of my gingivitis or gum disease. See, it’s another “itis”. The triggers can be stress, vaccine exposure, chemicals in the environment and allergies. Allergies can include materials like plastic, ingredients in food and even cat litter. There can be spontaneous healing of Pillow Foot or lit may require life long treatment. It’s impossible to predict a prognosis but we’re big believers in a non-invasive and holistic approach beginning with diet, according to the individual cat’s needs. There are holistic options like probiotics, homeopathy and feeding as clean a diet as possible like raw. The fewer the ingredients or additives the better. Check the ingredients on cat food label. If a cat can tolerate their feet getting wet, a warm Epsom salt foot bath can be soothing. Home care is helpful but it’s best to follow your vet’s protocol. 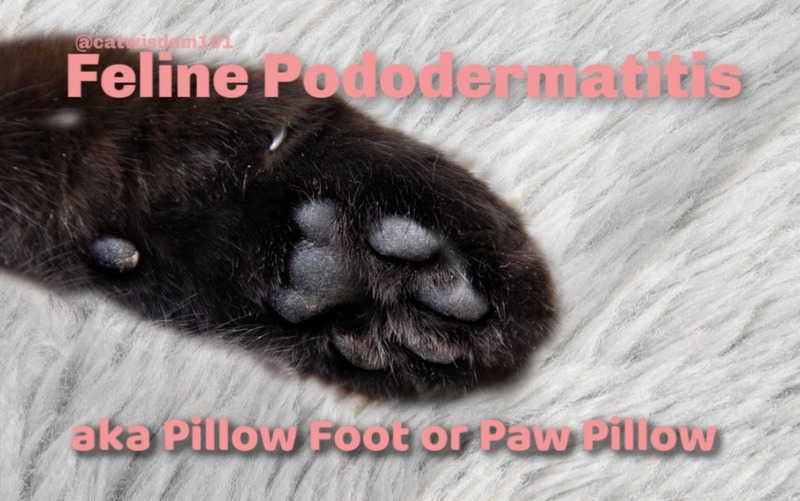 Paw Pillow, PPD or whatever you want to call it, is a condition we hope you never come across but now you know what to look for. You can find out more about Treasure from our friends who have met her Animal Shelter Volunteer blogspot. 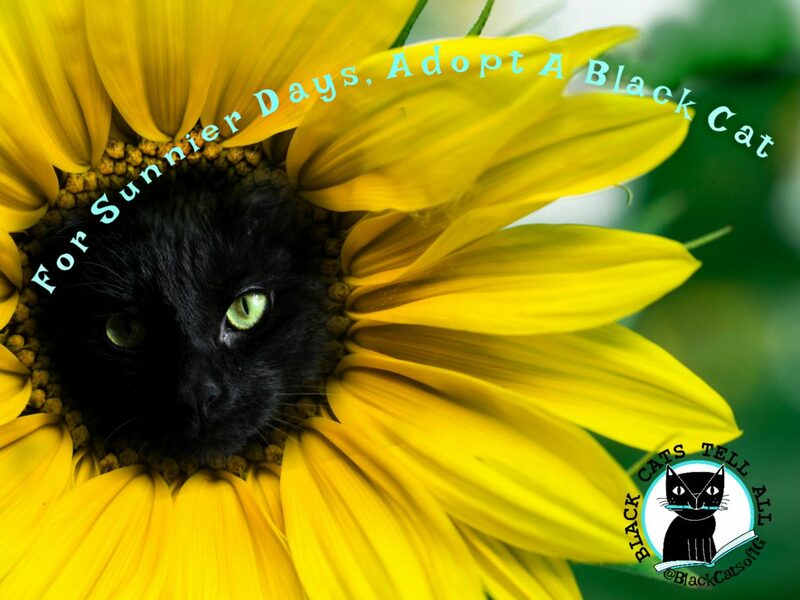 Treasure deserves a wonderful home as does this other black beauty at PAWS. This lovely young pantherette is Ahjha. I’d never heard of that name before and apparently it means welcoming in Arabic. Isn’t she darling? She has the same shy eyes like I did when I was a resident there. Ah, to be a youngster again. She hopefully has a long and happy and healthy life ahead. I’m glad you liked the kitten photo – It was perfect to see the baby sitting on your book! Clyde is an old Dude to be facing a dental. Sending love and best wishes to the sweet boy. There’s always something to learn here. Thanks. 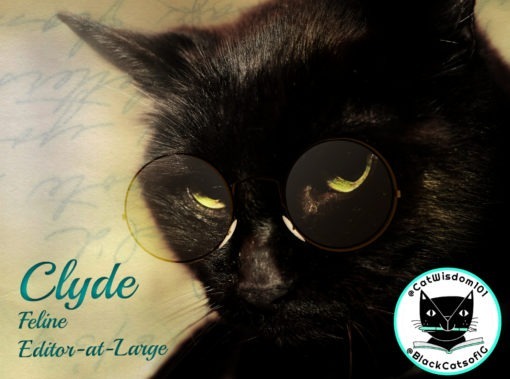 Sorry to hear about your impending dental, Clyde. We will share your post on Twitter. Good post with lots of info! WE love the baby pic but couldn’t see the pic of Ahjha. We also didn’t get this post nor the one about talk like a pirate day. You guys stay healthy!!! Thank you for information. Nice article. I love the adorable kitty photo with the book! And we love Maggie’s illustrations lots. The older cats here get doses of Vet CBD oil (Boodie) and Treatables Hemp oil (Binga – the oil in the CBD didn’t agree with her), and it helps lots with inflammation-based issues. Thanks for mentioning cbd. I take it myself but not tried it with cats yet.